This tree is commonly known as the Judas Tree, and less commonly known as the Love Tree. How it came by these names is an interesting story. The question of how this came to be known as the Love Tree is quite easy to answer. It's leaves are quite literally heart-shaped. It's more common name, the Judas Tree, comes from the misconception that it was from the branches of one of these trees that Judas Iscariot hanged himself. While it's possible that he did, these plants are native to the Middle East, it's more likely that it's a corruption of the French name, Arbre de Judée, or Tree of Judea. I can remember quite clearly the day I first saw my local Judas Tree. I’d just moved to a new area in the East of England and it was the day of the FA Cup Final. I was on an errand to buy some liquid refreshment. On the way, I noticed this spectacular tree in full blossom. The profuse flowers were a deep pink shade and it was unusual in two ways. The flowers had formed before there were any leaves on the tree, and they seemed to come from every part of it, even old wood and the trunk itself. If I hadn’t been more curious, I might have mistaken it for a Cherry Tree, but it was far more unusual. Luckily, someone was taking photographs of it, and she told me it was a Judas Tree. I got the drinks, went home, watched the match on TV with some family and later I looked up the Judas Tree to see what the fuss was all about. Cercis siliquastrum is an ancient plant in evolutionary terms, and related to the pea family. It has very simple pea-like leaves and flowers. Sure enough, it blossoms before the leaves are fully formed and the flowers emerge from old wood. I grew quite fond of it. In autumn, I collected a few of its flat seed pods and tried to grow my own specimen. I now have my own baby Judas Tree. 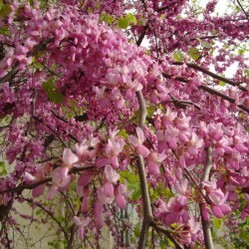 Cercis siliquastrum, or the Judas Tree, is native to Southern Europe and Western Asia. In Britain, it tends to survive well in areas where the climate is moderated by the ocean or sea, so near the coast in other words. It can be grown as a shrub or a small tree, so it’s quite well suited to small gardens. If you’re looking for something like a flowering cherry, but you want a tree that’s less common and a better talking point, I’d recommend the Judas Tree. When it flowers, it’s quite stunning, and the leaves that follow later have that interesting heart shape that give it its more romantic name, the Love Tree. Look out for it in garden centres. It’s not always easy to find and you could search for it online if you get stuck. In North America, Cercis Canadensis is a quite similar tree. It’s sometimes called the Eastern Redbud or Forest Pansy. Has this page been useful to you? It really is quite unusual, especially the way it flowers from the old wood. It's very good for small gardens and even grown in big pots. This looks like a nice tree to have in one's garden! Thank you for the article. Have you ever heard of the Medlar tree? Did you know it bears edible fruit? What recipes are there for the Medlar fruit?